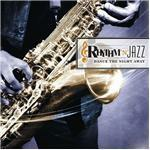 Buy and Download > Description Rhythm 'n' Jazz: The smoothest jazz on the planent! R&B Classics in jazz. Rhythm 'n' Jazz: The smoothest jazz on the planent! R&B Classics in jazz.